Democrat Pete Gallego is challenging U.S. Rep. Will Hurd for the sprawling CD-23 seat. Hurd won the swing seat from Gallego two years ago; no incumbent has won a second term in eight years. SAN ANTONIO –U.S. 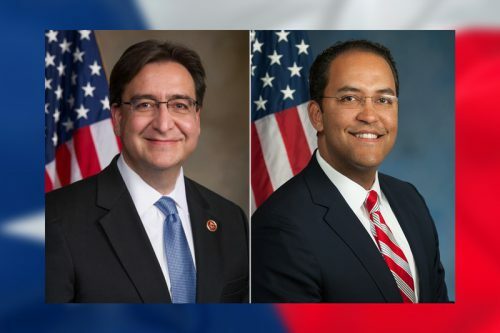 Rep. Will Hurd claimed victory in his re-election bid Tuesday night, becoming the first incumbent to hold onto the Texas 23rd District in eight years. Hurd claimed victory over an old rival for the second time, Democratic former U.S. Rep. Pete Gallego in the state’s only competitive federal district on Tuesday night, on the heels of Donald Trump’s apparent election to the presidency. See the latest results here. In his remarks delivered around 1 a.m., Gallego said he called Hurd to congratulate him – ending a bitter campaign on what appeared to be a collegial note. Gallego acknowledged the devastation his party faced nationally. “There is a lot of concern and trepidation,” he said, alluding to the likely ascension of Trump to the White House. Hurd’s win was one of many blows to the Democratic party nationwide – he was considered one of the most vulnerable House Republicans and among the easiest pick ups for the Democrsts. The conventional wisdom was that Trump’s anti-Mexican rhetoric could be an albatross around Hurd’s neck and Gallego staked his entire campaign around tying Hurd to Trump. Hurd, a former undercover CIA officer, repudiated his party’s nominee upon the release of a vulgar video showing Trump boasting about groping women. Trump, however, outperformed expectations nationally and appeared to help Hurd with at least some voters in the district. Hurd ran one of the best executed and funded Congressional campaigns the state has ever seen. The hope among some Texas Republicans is that he can hold onto the seat long enough and build enough constituent loyalty that he can cease the flip flop nature of the district until the next round of redistricting. Hurd’s win bolsters U.S. House Speaker Paul Ryan’s standing among House Republicans. Ryan was a strong supporter of Hurd’s re-election, and Hurd’s presence in the GOP conference eases Ryan’s path to a second term as the House GOP leader. Just like every cycle, the 23rd Congressional District is all-but-certain to be a top target for the opposition. But the environment will have changed from the last two midterms. Over the last eight years, Republicans did well in those cycles, thanks to a combination of lower voter turnout and as a backlash to the Obama administration. Prior to serving in Congress, Gallego was a longtime member of the Texas House. Once in Washington, he became a sentimental favorite among House Democrats, as senior members recruited him to run against Hurd just days after his 2014 loss. House Minority Leader Nancy Pelosi signaled throughout the 2016 cycle that winning this seat was a top priority of her political agenda. – Abby Livingston and Elena Mejia Lutz, Texas Tribune. This story originally appeared here. This entry was posted in KRTS News and tagged Border Issues, Election 2016, Pete Gallego, politics, Presidential Election, Texas Politics, TX-23 District, Will Hurd. Bookmark the permalink.